Take south Sam Houston Tollway to Pearland Parkway. Go south on Pearland Parkway until the stoplight at Oiler Drive, (Pearland High School stadium on your right). Turn right on Oiler Drive, which turns into Bailey Road (CR 1010) at next intersection (Highway 35). Continue straight on Bailey Road and cross bridge; Natatorium will be on your right at the corner of Bailey Road and Veterans Road. Parking is available in front of the Natatorium and behind the facility off of Veterans Road; no parking on the grass is allowed. There is no meet parking in front of the Recreation Center side, or on the side lot alongside Veterans Dr. as these are reserved for Recreation Center members only. Overflow parking is available at Turner High School on Bailey Rd (CR 101). There is no RV parking on the Recreation Center and Natatorium grounds. This is five session, 2 ½ day, timed-finals meet with a PM session on Friday, AM/PM sessions on Saturday and Sunday. Warm-up: Host team will publish PM session warm-up and start times with warmup/timing assignments on Gulf webpage. *Split warm-ups will be in effect, with assignments posted on the Gulf Swimming website. 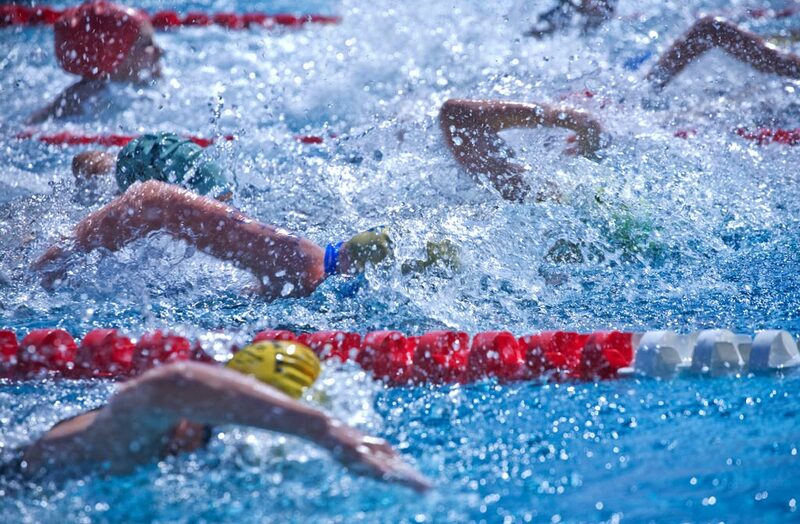 Lane assignments for warm-ups and timing will be designated in the heat sheet, and posted on the Gulf Swimming website by Monday, May 13, 2019. 100 and 200 meter events will be run utilizing chase starts alternating odd and even heats. All girls’ heats will be swum first utilizing both ends of the pool followed by the boys’ heats utilizing both ends of the pool. Odd heats will start at the XXXXX end of the pool and even heats will start at the XXXXX end of the pool. All 400 meter events will be swum fastest to slowest using chase starts, alternating girls and boys heats. Girls’ heats will start at the activity pool end of the pool and the boys’ heats will start at the diving board end of the pool. All 50’s will start at the diving board end of the pool. Qualifying Times: 12 & Under must have 3 B times or more to enter the meet. Times can be earned in any event including those not offered at this meet. 11-12 must have the 2019-2020 A time standard for the 400/500 free to enter the 800 free. 11-12 must have the 2019-2020 A time standard in the 200 IM to enter the 400 IM. Number of Events: Swimmers may compete in up to three (3) individual events per day. Eligible Teams: Venues will be balanced by team numbers. The team lists will be posted on the Gulf website. Swimmers attached to a registered Gulf Swimming team, swimmers in the documented process of transferring to a Gulf Swimming team may participate in this invitational meet. An unattached swimmer not affiliated with a USA Swimming Club must follow the same entry procedures as those swimmers affiliated with a team. In order to be seeded in a Gulf meet, an unattached swimmer not affiliated with a USA Swimming Club, must enter by the entry deadline, following the entry procedures in the Meet Announcement, and provide proof of a registered coach responsible for their supervision on deck during the meet. All unattached athletes will be assigned a meet location by the TPC Chair upon assignments being announced.